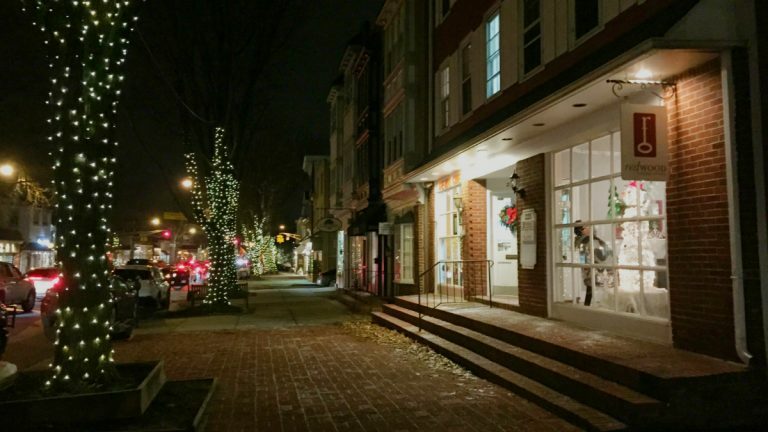 Downtown Haddonfield turns on the holiday charm this weekend. Its downtown corridor, one of the most successful main streets in South Jersey, is a favorite for area Christmas shoppers. Trees will be decked out with white lights and luminaria will line the streets for candlelight shopping until 9 p.m. Horse drawn carriage rides will also be offered, evoking even more old-world charm. The festivities kick off with a tree lighting ceremony at Library Point on Black Friday, Nov 27, at 6:30 p.m. and will be immediately followed by a parade to Kings Court, complete with an appearance by Jolly Old St. Nicholas. Several local bands will be on hand making merry music, including the Pine Barons Chorus, Shades of Harmony Chorus, Mp4! Quartet, Dr. Lou’s Quartet and Haddonfield’s own Pick Up Band. The holiday fun continues on Small Business Saturday, Nov 28 with live music from 11 a.m. to 5pm at Kings Court and at Haddy the Dinosaur. Performing will be Three Good Men, Special Occasion Quartet and DJ Frank Staff. Haddonfield’s candlelight shopping experience (with live entertainment) will be repeated every Friday evening until Dec. 21.